Workers wrestle with a replica of Barbourofelis fricki, an ambush predator that stalked camels, horses and other prey across Nebraska roughly 7 million years ago. 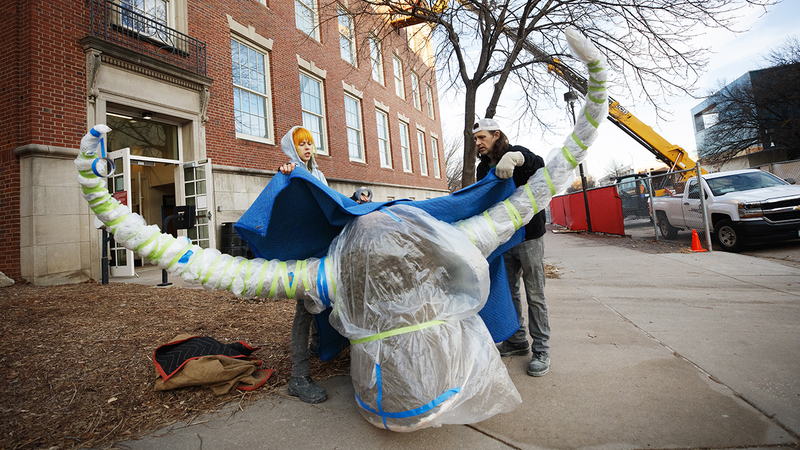 The saber-toothed carnivore represents a centerpiece of the new fourth-floor expansion to the University of Nebraska State Museum at Morrill Hall. A girl approaches Barbourofelis fricki, the saber-toothed carnivore that ambushed camels and horses across the expanses of Nebraska roughly 7 million years ago. Her younger brother stands before an 8-foot-long tabletop, digitally dissecting a largemouth bass to identify its parasites. Other exhibits explain how scientists collected the vast information that graces the fourth floor. An ice core extracted from Antarctica serves as a lesson in using trapped gas bubbles to determine the composition of ancient atmospheres. A windowed lab space will let visitors watch as researchers examine fossils of the animals and plants that once called Nebraska home. And an exhibit on Paleo-Indians — Nebraska’s original inhabitants — explains how sewing needles found at burial sites confirmed the tiny tool’s outsized importance to surviving an ice age. 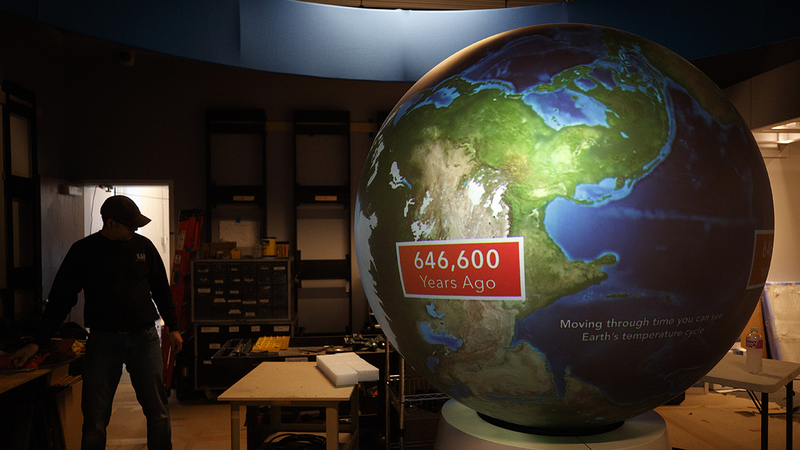 A 5-foot-wide globe will feature short films on natural and human-driven climate change. The replica head of Bison latifrons, an extinct bison species whose height and horns could span roughly 7 feet. That scale required major contributions from many people and organizations, especially the Nebraska-based Theodore F. and Claire M. Hubbard Family Foundation, the Claire M. Hubbard Foundation, Ruth and Bill Scott, and the Nebraska Environmental Trust. It also had Weller’s team calling on the expertise of university, state and occasionally worldwide researchers.